Have you seen blueberry stem gall? : Spotted Wing Drosophila Latest information from the NYS IPM Program. A tiny blueberry stem gall wasp on a blueberry twig (magnified). Actual size about 2 mm long. 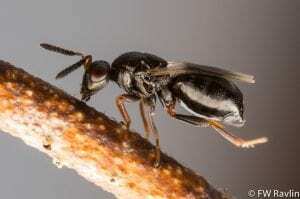 The blueberry stem gall wasp is a native insect of the Northeastern United States. 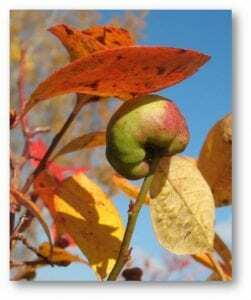 While traditionally it was rarely seen in commercial blueberry production, recently increased numbers of galls have been observed in Michigan on older varieties especially ‘Jersey’, ‘Pemberton’ and ‘Northland’. The increases in blueberry stem gall are likely due to a combination of changes in management. Researchers at Michigan State University are studying control strategies, along with breeding new varieties for resistance to gall formation. To achieve this, they are looking for gall samples from across the Northeastern US. A blueberry stem gall on 1-year-old wood as seen in late summer or early fall. After winter, by early spring, galls will have turned brown. If you find the galls on blueberry bushes in your field, or on non-cultivated blueberry bushes around your farm, please collect them. Prune them off. Collect fresh galls on last year’s wood. These are typically on small diameter twigs and are about the size of a penny. Don’t collect galls that have exit holes in them. These are usually gray, on older, dead twigs and have black exit holes about 1 mm in diameter. The tiny adult gall wasps cut their way out of the galls, around bloom time, leaving the exit holes. You’ll be helping minimize damage from this insect in your blueberries AND helping scientists develop better blueberry varieties. During the Blueberry Intensive workshop in Dutchess County, we collected galls from ‘Duke’ and I sent them to Dr. Fanning. Thanks in advance for your help with this project! And, no, they don’t sting.